Lies and deception are insidious, for once, they have been believed and accepted by well-meaning individuals, these individuals, in their ignorance, become agents for the spread of these falsehoods. This is how lies and propaganda are spread from generation to generation. A parent is indoctrinated into the lie, and then the parent indoctrinates their children, who in turn indoctrinate their children, and so on, down through the generations. 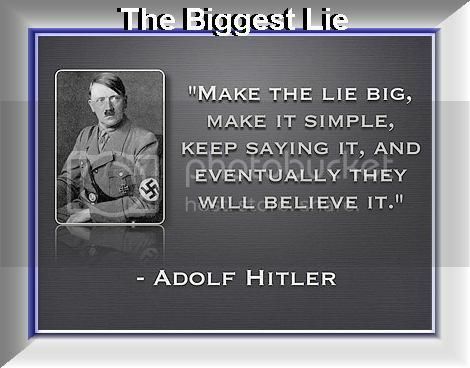 Speaking about the most effective way to propagate the spread of lies and disinformation to as many people as possible, Adolf Hitler, the Führer of the Nazi Third Reich, stated that one should "make the lie big, make it simple, keep saying it, and eventually they will believe it." This statement clearly shows that the real goal of those who are bent on the attainment of totalitarian power is to actually control the minds and belief systems of those upon whom they impose their rule.